Crouching Spider-Louise Bourgeois, originally uploaded by kris497. Originally produced in 2003, this cast from the artist’s famous “Spider” series was made specifically for display in San Francisco. Louise Bourgeois, 95, is considered to be one of the world’s most important and influential artists living today. She was born in Paris in 1911 and moved to New York in 1939 where her prolific career has spanned seven decades. Concurrent with the display on the Embarcadero, Ms. Bourgeois’s work is on a worldwide museum tour starting with the Tate Modern in London and traveling to the Centre George Pompidou in Paris, the Solomon R. Guggenheim Museum in New York City, the Museum of Contemporary Art in Los Angeles and the Hirschorn Museum and Sculpture Garden in Washington, D.C. The sculpture, courtesy of Gallery Paule Anglim, San Francisco and Cheim & Read, New York, will be on loan for eight months or longer. 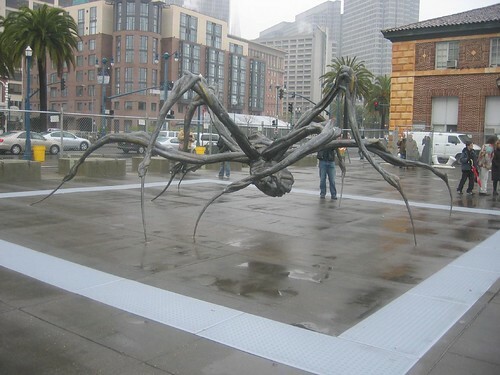 “Crouching Spider” is part of the San Francisco Arts Commission’s Sculpture in the City program, which brings both permanent and temporary sculpture installations by local and national artists to the City. This is a temporary project of the San Francisco Arts Commission and is placed on the Embarcadero courtesy of the San Francisco Port Commission. Art Enrichment funding is provided by the San Francisco Public Utilities Commission." opposition could suggest contradiction. contradiction could suggest a negation of sorts. do opposition and contradiction in fact = negation? do they oppose each other so successfully that they succeed in negating one another? wiping it out? and existance once there and then no more? ex. "why do you have no confidence? why do you have confidence?" why go through the energy of saying both? what is the motivating factor? is it to have the words aligned in opposition or is it the idea of opposition that must be expressed rather than the action? call for papers on poets theater. Please respond with an essay abstract and bio by SEPT. 12. A print project may be in the future on the poet's theater topic, so we are happy to learn of your interest. In recent contemporary poetics, the term "poet's theater" has become linked with the "Language" group of writers and often directors of poetry-plays produced as low-budget staged performances in the late 1970's and '80's. Today, new productions of classic "Language"-orientedpoet's theater abound, by writers including Leslie Scalapino, Carla Harryman, Charles Bernstein, among others. Yet there are also many contemporary playwrights in other settings doing work that is not only aesthetically related to "Language"-oriented theater, but which might be productively critiqued in terms articulated by Language writers and others writing on avant-garde performance art. These "other" are theater writers are those who are engaging in "poet's theater," by virtue of treating a written text as an act of performance -- the drama thus emerging not from some external "signified," but from within the "signifier," the poetic language, itself. This panel is an attempt to ground a definition of the term "poet's theater" in a potentially expanding notion of the contemporary working scene of today's American theater, both through under-financed ssm all public venues (cafes or coffee houses or art-spaces) or in venues like Off-Broadway. It is also an attempt to take the recent use of the term by the Language writers into other realms of "language"-oriented theatrical poetics. We wish for presenters to look at what the embodied stage and poetic experiment have to offer one another, in practice and/or in conceptual theories. We are proposing this panel to the Louisville conference directors (conference to take place in February '08), with the hopes that we can bring new perspectives into a discussion of an often under-considered form of contemporary poetics: that which is written to be staged. We are looking for papers that consider specific poet's-theater works and their authors, approached from some knowledge of contemporary poetics theory or performance theory (or both). Since our topic concerns CONTEMPORARY poet's theater, please submit paper proposals only on poets of the theater who have emerged during or since the early stages of "Language" writing (including John Ashbery, Bernstein, Ntozake Shange, Harryman, Scalapino, Amiri Baraka , Cherie Moraga, Tracie Morris; as well as "non-poet" playwrights like Adrienne Kennedy, Anna Deavere Smith, or Suzan-Lori Parks -- the latter of whose works are based in a non-linear use of lyrical language). Historical influences, however, are also of interest. Send a 250-300-word abstract and title describing your paper topic no later than SEPTEMBER 12, by e-mail, to Laura Hinton ( laurahinton12@gmail.com). pompous boy playing at what? so they can reach farther than me. A Chicago native living in SF and attending graduate school to complete her MFA in poetry.